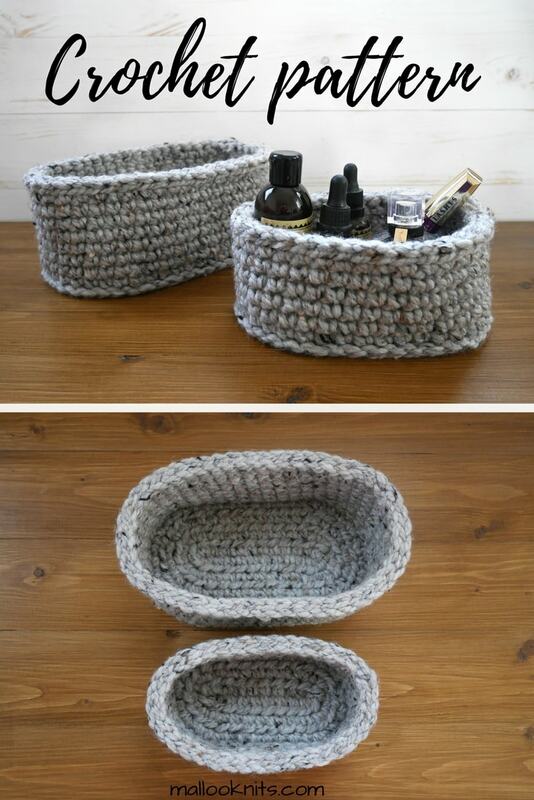 If you are an organizing freak like me then you will love these baskets! They work up real quick and can be used on several occasions. I mostly use these in my bathroom but can easily see them placed on a desk filled with letters and cards. 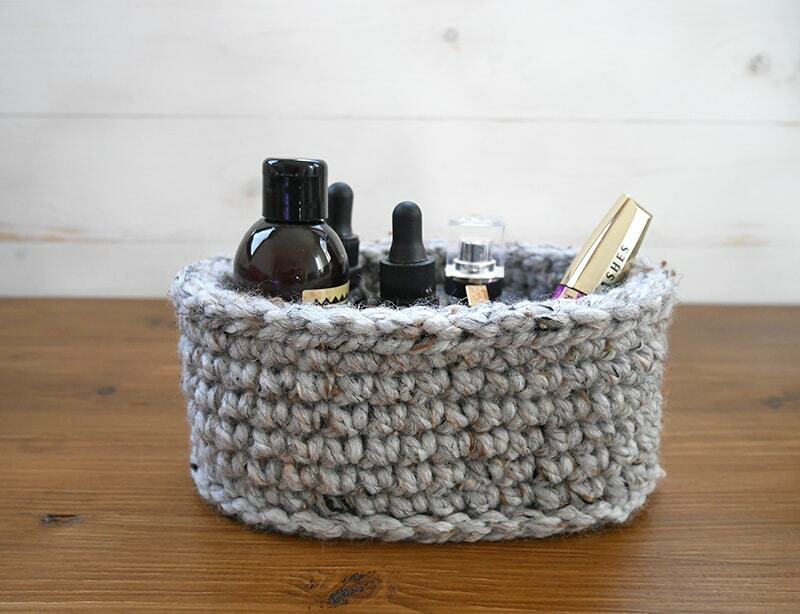 I love these crochet oval baskets because they are rounded and I like the more fluent shapes than the geometric squares. They are made with bulky yarn and hold their shape nicely. 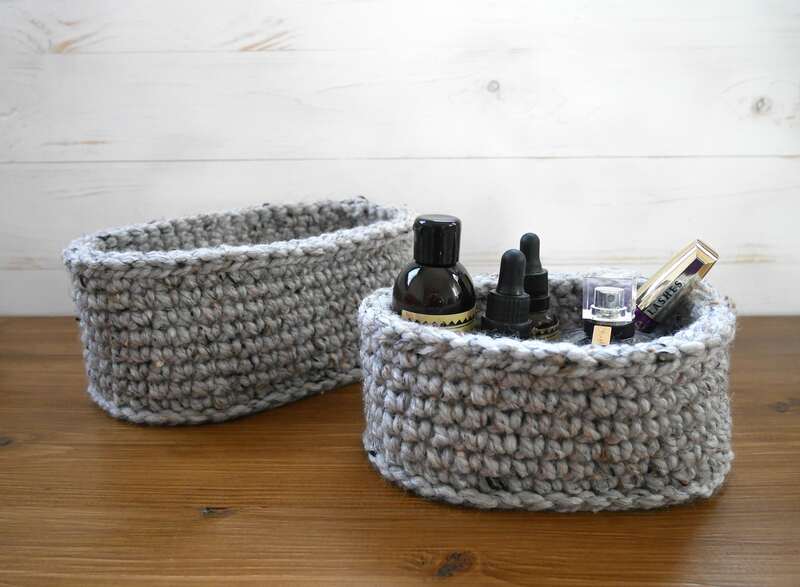 I came up with two sizes because having things in sets is adorable, plus, you can always find more than enough little things just lying around the house that need a little basket. R4: ch 1, only sc in each st around in the third loop only, st to join (36) Learn how to spot the third loop of half double crochet. Learn here how to spot the third loop of half double crochet. That’s it! I hope you had fun making them! Tag me @malloo.knitwear and use #malloomakers on Instagram so I can see your projects! Lovely! 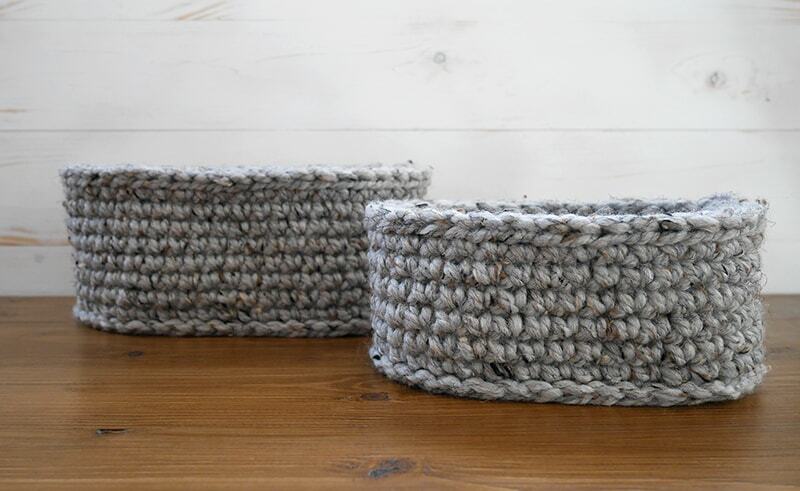 I recently made some round crochet baskets to hold our little girl’s belongings. I need to make her some oval ones, to! Yes! I bet you need all kind of baskets for kid’s stuff! Will any super bulky yarn work, or do you need a percentage of wool to make it stiff enough? These are really cute by the way! Thank you Layne! I believe that having a percentage of acrylic is better if we are talking about stiffness. I love these! Would you share what yarn you used? Hi Miranda! Thank you so much! I used James C. Brett Rustic Mega Chunky yarn. 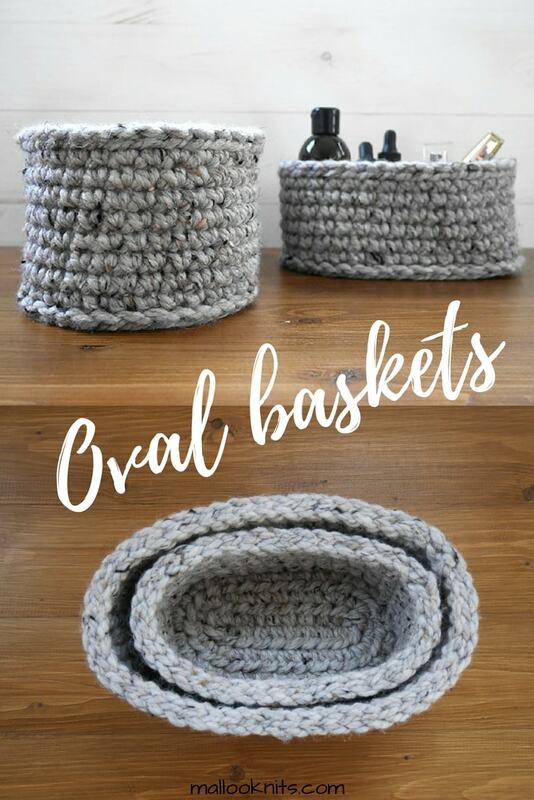 could this oval basket be done with tshirt yarn? and do you have a list of abbreviations? Abbreviations table, fixed! Thanks for noticing! Yes, I believe it will be possible to make them with t-shirt yarn but I can’t guarantee the size of them. Give them a try if you like! I am confused on row 5 for the large basket. What do you mean by third loop only? I am also new to crochet. How many skeins do each of these baskets take? I used Lion Brand Hometown USA SUPER BULKY (6) yarn. It will make one large basket. I still consider myself to be at beginner crochet level. I made the small basket with little to no problem. I used Lion Brand Hometown USA super bulky (6) yarn. I felt the end result to be flimsy. I’d prefer a sturdier basket. Any recommendations on how to accomplish this with same pattern? Maybe try to go down a hook size. I have experimented a bit, because I prefer the sturdier basket too. Using two strands of super bulky (#6 weight) works really well. I use 100% acrylic. Use the smallest hook size you can that will allow the yarn to stay on the hook without having extra room. Will post pictures after I try this pattern. Thanks for the input! Would love to see those pics! In round 4 of small basket and round 5 of large, what is meant by third loop only? I used the front loop in doing the small basket and it looked similar. Hi Susan! I have updated the post to include a link on how to find the third loop in half double crochet. on large basket round4, what exactly is meant by (hdc2,2hdc in next st). I’m reading that as 4 hdc in one st. Thanks for clearing this up for me. This means you will have to do one hdc in each of next 2 stitches and then 2 hdc (an increase) in the next stitch. So, you will have 4 hdc in the span of 3 stitches and you have to do this 2 times (that is what x2 means). I hope this is clear enough! Beautiful! How many skeins of the James Brett Mega Chubky Rustic would you recommend for one small and one large basket? You will need 2 skeins for both of them! I’m struggling a bit here….self taught. Am I slip stitching to the first stitch of the round, chaining and then moving to the next stitch to start? Or am I slipping in the previous chain, chaining and starting in the first stitch of the round? I’m driving myself crazy! Hahaha! Don’t worry Julia! We will figure this out together. 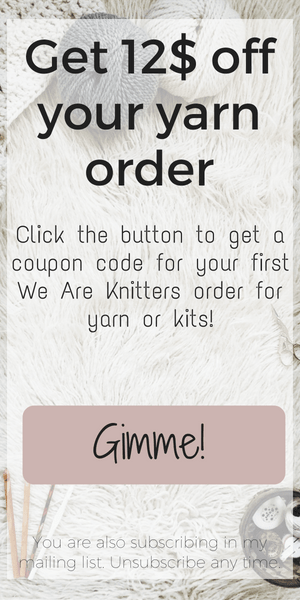 You are going to make a slip stitch at the end of every round to join rounds together. Then chain 1, and you will make your first stitch at the same stitch as the slip stitch and chain 1. Is that clear? So after the last stitch of the round, i’m to ss to the first stitch of the previous round, chain 1 and then use the same stitch? Also – am I free to sell on Etsy with credit to you? Yes, after the last stitch of the round you must sl st to the first stitch of the same round and that is how it will close. And then chain 1 and use the same stitch as you said. TThanks for publishing this pattern – I love quick projects and this is definitely a keeper. I made the small one using homemade tee shirt yarn and it is adorable. Since I have a bin full of that yarn, I’m planning to make more to fill with homemade Christmas goodies this gifting season. That is so good to hear, Sandy! And what an excellent idea to fill your crochet baskets with homemade Christmas goodies! I really like the sizes of these baskets but having trouble understanding what is meant by, “Continue on the other side of the chain. Hdc 6, 2 hdc in last st, sl st (20)”. I’m not sure what is meant by the other side of the chain. you can find videos on youtube explaining exactly what to do. It will be difficult to try to explain here only with words. A video is the way to go here. This pattern is super cute! Thanks so much! !